The fundamental role of the Lord-Lieutenant is that they are Her Majesty’s representative in their County and consequently, it is their foremost duty to uphold the dignity of the Crown. 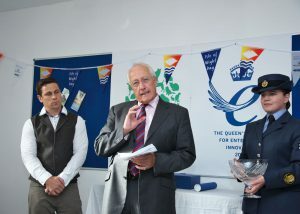 The office of Lord-Lieutenant is an unpaid and non political one and they can serve up until the age of 75. On their retirement, a new Lord-Lieutenant is appointed by Her Majesty with the advice from her Prime Minister. 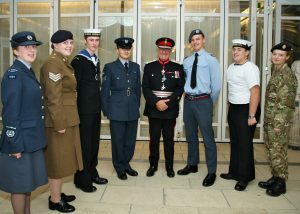 The Lord-Lieutenant is supported by a Vice Lord-Lieutenant and Deputy Lieutenants (there is an upper limit to the number of Deputy Lieutenants that can be appointed in each County according to the size of its population. 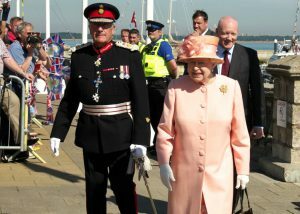 Responsibilities include planning all Royal visits to the Island, presenting medals and awards on behalf of The Queen, advising on submissions for honours nominations, nominating Island residents for Royal Garden Parties and advising on matters concerning the Crown. The office is military in origin and dates from the reign of Henry VIII when the Lord-Lieutenant was charged with raising militia for local defence. This traditional link with the Services remains, although many Lord-Lieutenants are not from a Service background and the role has evolved to meet the demands of the 21st Century. However, here on the Isle of Wight there are still strong links to the Reserve Forces, cadet forces and other uniformed voluntary bodies such as St John Ambulance. From earliest days the Lord-Lieutenant has also been closely associated with the magistracy and today the Lord-Lieutenant is an honorary magistrate and maintains links to the judiciary as Keeper of the Rolls (formerly Custos Rotulorum). As Chairman of the Advisory Committee on Justices of the Peace he is responsible for the recruitment and selection of magistrates. Lady Lord-Lieutenants wear a Badge of Office to indicate their position. Since at least the eighteenth century a military-style uniform has been worn by male Lord-Lieutenants. Over time, the design of the uniform changed in line with changes made to army uniform. At present, it is a dark blue uniform in the style of a General Officer’s Army No. 1 dress (but with buttons, shoulder-boards, sash etc. in silver rather than gold). A cap is worn, and a sword with a steel scabbard. The badge on the cap etc . varies depending on where the Lieutenant’s County is situated: a rose is worn in England, shamrocks in Northern Ireland, a thistle in Scotland and Prince-of-Wales feathers in Wales.